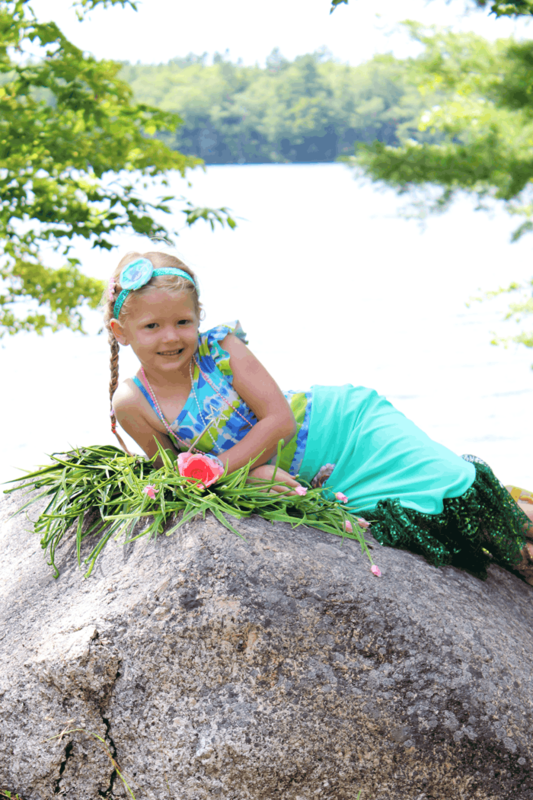 Since attending the Barbie and the Pearl Princess movie premiere and watching The Little Mermaid countless times my daughter has been obsessed with Mermaids. 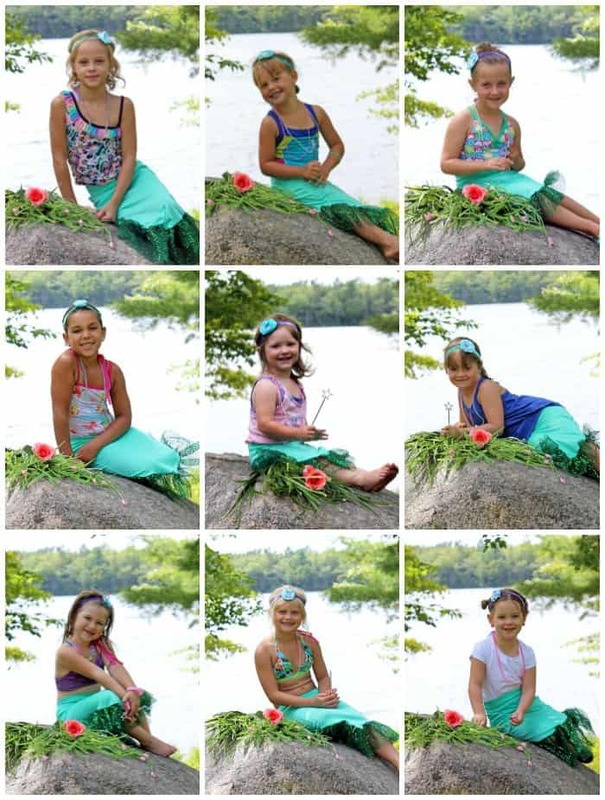 So when her birthday rolled around a few weeks back, it was only natural she wanted to have a mermaid party. 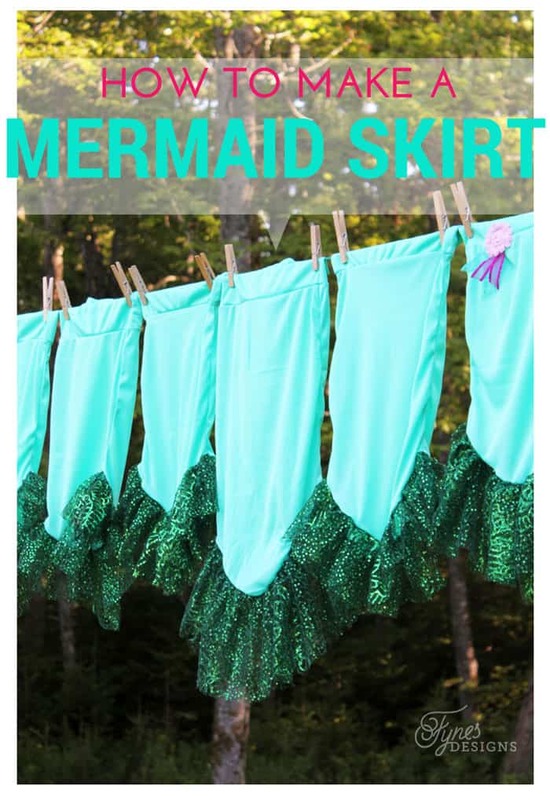 What is a mermaid without a beautiful fin, or in our case a Mermaid skirt?! 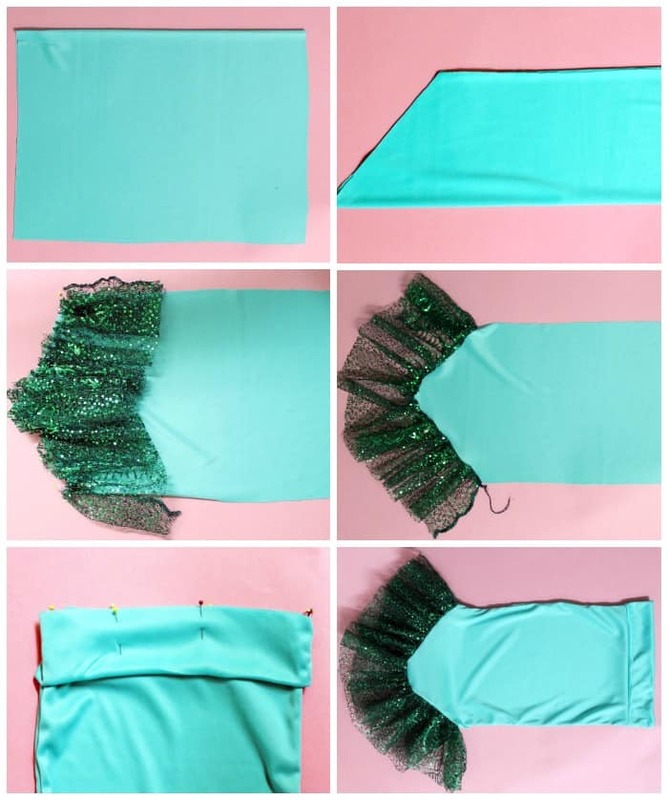 These mermaid skirts are super easy to create, a perfect beginner sewing project. Stretch fabric, I used dress lining because it was only $1.99 a meter, but jersey, or other knits will work fine. Sparkly fabric, again I used what was on sale, but there are lots to choose from in the party and formal wear section. sewing machine, serger if you have access to one, or a zig zag stitch will work fine. Cut 2 rectangles from the knit fabric. Fold in half lengthwise. Measure up 6″ from the bottom outside corner, cut from that point to the fold, cutting off a triangle to create a point. Ruffle the 2 pieces of sparkly fabric individually stitching the top edge. See this post on I heart Naptime if you’re new to ruffling fabric. Line up the sparkly ruffle with the pointed end on each of the skirt pieces. Pin and baste in place. Serge or zigzag stitch along the raw edge of each skirt piece joining the stretch and sparkly fabric. Place the two skirt pieces together right sides together. Baste and lock edges to create a skirt. Fold the waist piece in half lengthways and stitch end to create a circle. Fold circle in half widthwise and place overtop the end of the waist of the skirt lining up raw edges. Serge or zigzag around the raw edges of the waistband. Flip upwards. Trim treads to complete. Add embellishment to waist if desired. 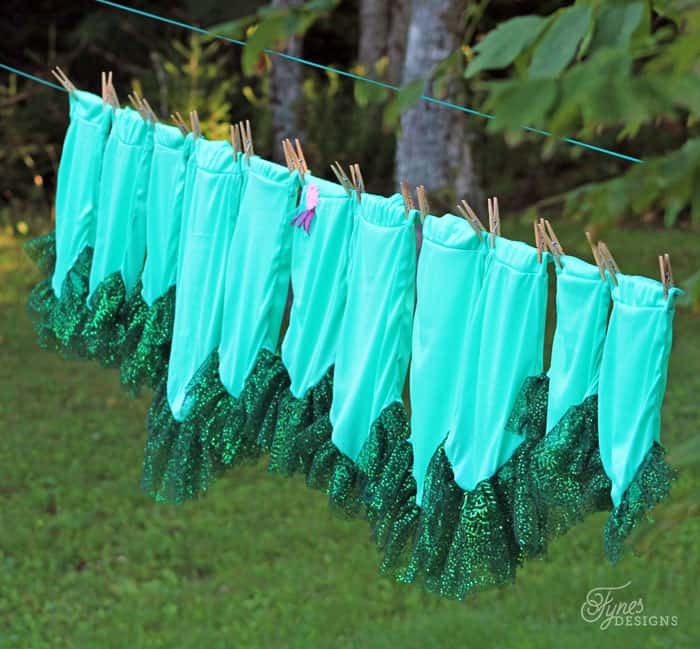 These Mermaid skirts are perfect for dress-up, birthday parties, and even Halloween costumes! Aren’t they incredibly sweet on the little mermaids?! When standing the Mermaid skirts are ankle length so just the feet are poking out. My daughter has been wearing hers around the house for weeks now! 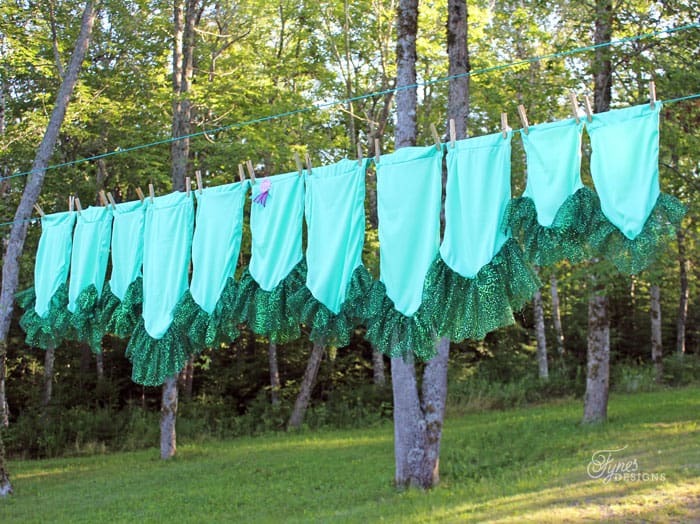 I hope you like this free Mermaid skirt pattern I can’t wait see your little swimmers! Just wondering if there are other comments here. I’m just getting back into sewing and would love to see the inside of the skirt with the sparkly fabric pinned in. These are so adorable! It’s actually funny because our kids are always playing mermaids and they stick both legs into one leg of a pair of pants. We worry they’ll fall so this is s a much better solution! Thank you for linking up on the #HomeMattersParty linky. ha ha, thats funny, you better make them one… for safety sake! I have faith you can do it! Its really easy, if she is anything like my daughter you’ll have a hard time getting her out of it! Thanks so much, off to check it out!